Curve tracks display well curves and extracted curves from volumes. A curve track can display one or more curves, or be left empty to display marker and horizon annotations. A distinct curve type exists to highlight cross-over between two curves. Read more about using Crossover Fill Curves. 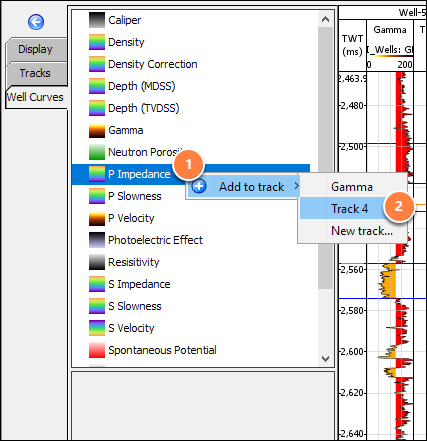 In the Track panel, click the blue "+" icon and select Add Curve Track. A new curve track is created in the tree and is shown in the view. 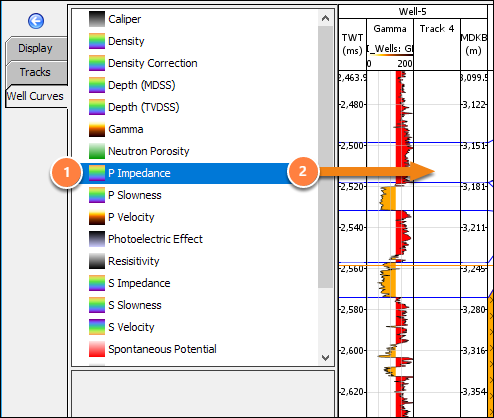 Select or click the curve track to show details and change settings. Tip: You can change the Appearance, Axis Settings and/or Markers for multiple tracks at once by selecting several tracks first, then updating the options. In the Curves tab, drag a curve into the track. 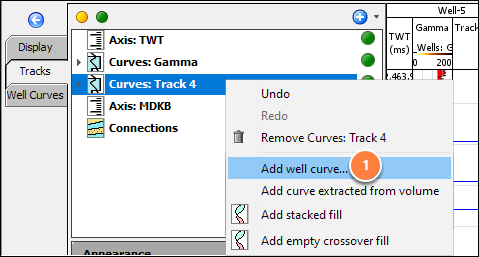 In the Curves tab, right-click the curve and select Add to track. Click the track where this curve will be added to. 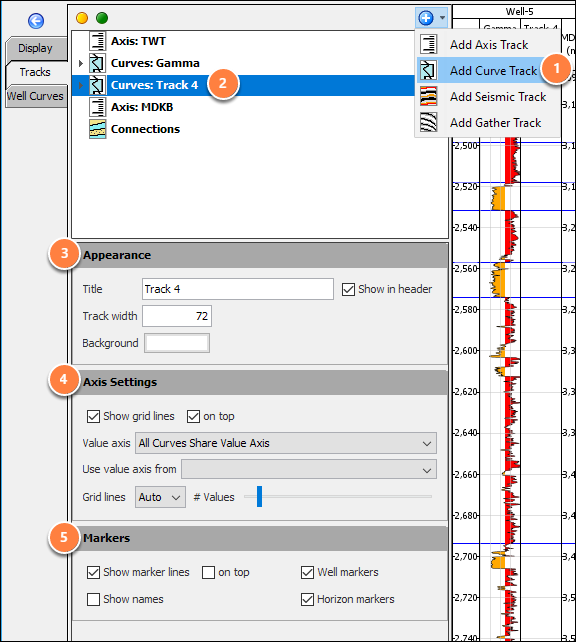 In the Tracks tab, right-click track and select Add well curve. 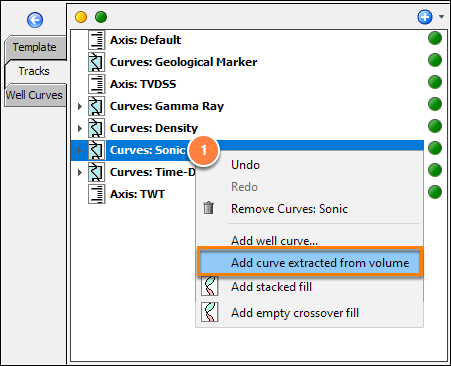 Select a curve from the Well Curves tab. Drag-and-drop the curve into the tracks window. Dropping the curve into an empty space creates a new track. Dropping the curve onto an existing track adds the curve to the track. Note: Curves are displayed in the order they are listed in the track panel. Drag curves up/down in the Curve Track to change the displayed order. Click the Well Curves tab. To include more than one curve to the track, press CTRL+left click and pick the relevant curves to be included to the track. Note: The name of the first curve selected will be used as the default title for the track. Press right-click and select Add to track and pick an existing track or a New track. Select the type of curve from the Class drop-down menu. 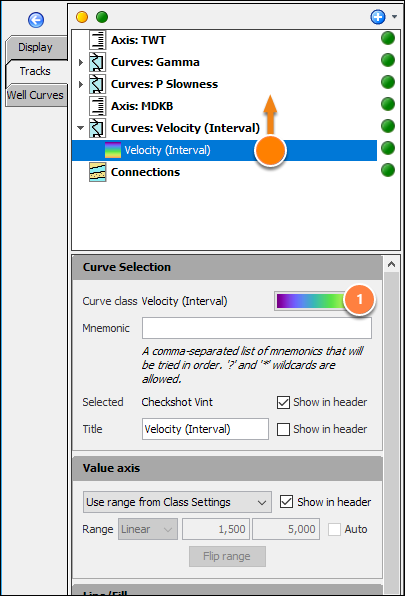 Curve class can be modified by clicking on the colour bar as well as the Mnemonic and Title. Note: Dragging a track up/down in the Tracks tab also re-arranges the vertical track on the right. 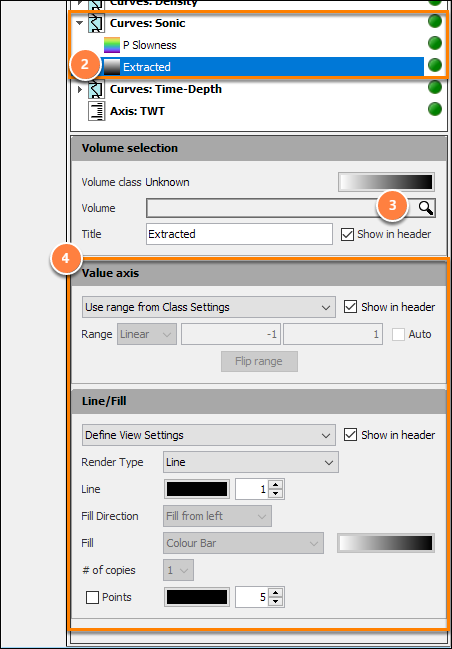 Select the new Extracted curve to show the settings.